Way back in 1992, we thought that the explanation for attack by an electrophile on the alkene from the syn face was electrostatic (although it did depend on the nature of the electropile; thus we concluded that attack by Hg(OH)2 was electrostatic, but by BH3 was orbital controlled). Recently, a different explanation has emerged, relating to how the fundamental normal vibrational modes of the molecule interact with the transition normal mode for the reaction. A new example of this, relating to reaction of the isomeric 2 with a peracid has recently been discussed on Steve Bachrach’s blog. 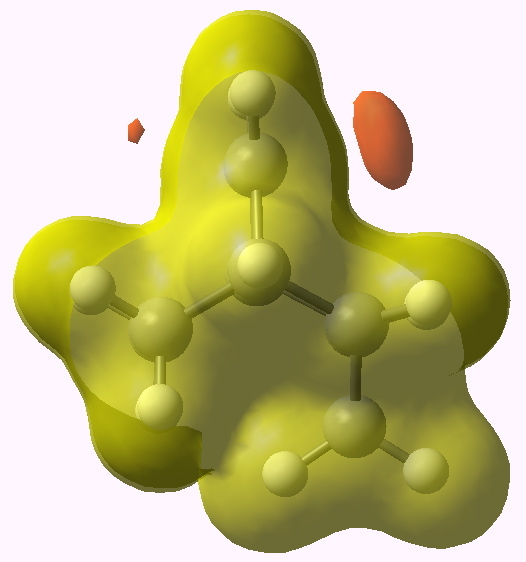 Here, the peroxide of the peracid is thought to act as an electrophile (although one must bear in mind that it does bear two electron lone pairs!). The conclusion was pretty clear cut; the experimental preference for syn (92%) over the anti isomer (8%, ΔΔG = 1.4 kcal/mol) was NOT due to electrostatic effects, but due to distorsional asymmetry in the vibrational mode that couples/forms the transition state mode. I could not resist revisiting this system. As in 1992, a molecular electrostatic potential was calculated for 2. The method used was wB97XD/aug-cc-pvdz, and if you want the archive of this calculation to evaluate it yourself, see here). MEP for 2. Click on diagram for 3D. A very clear electrostatic bias for syn attack emerges (orange = attractive to a proton=electrophile). This electrostatic picture is not directly related to any distortional asymmetry, although of course both could arise from the same electronic factors. They may indeed be different manifestations of the same underlying nature of the wavefunction. But I would claim here that to make the clear statement that electrostatic effects are NOT responsible for the discrimination in this reaction is perhaps too simplistic (electrostatic potentials were not reported in the original article). The control experiment is 3, which is known to be far less selective. The calculated electrostatic potential likewise shows much less discrimination. Is there another take on 2? Well, how about an NBO (natural bond order) analysis? 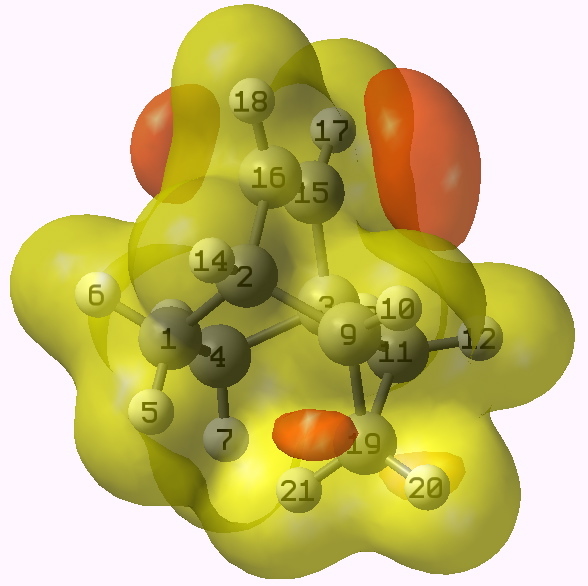 The interaction energy between the filled C1-C2 orbital and the antibonding C15-C16 π* bond is 3.24. 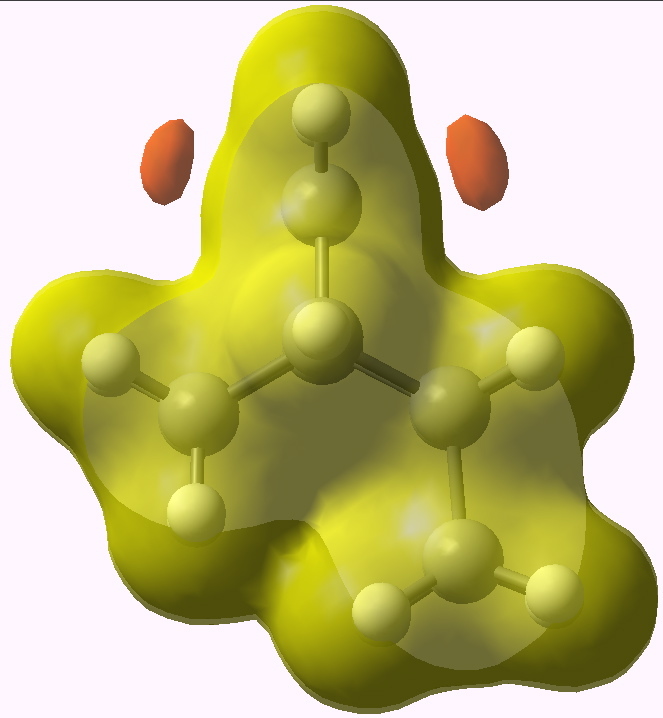 This could be regarded as pushing electrons into the anti-periplanar syn face of the alkene. The corresponding C2-C9/C15-C16 interaction resulting in an anti-preference is less at 2.55 kcal/mol. This effect arises because the C1-C2 bond (localised as an NBO) is a better donor (E=-17.8eV) than C2-C9 (E=-18.1eV). Because C2 is common to both, it must be the difference between C1 and C9 (i.e. the hybridization of each). Perhaps it’s an orbital effect after all? I would conclude by saying that it can be ferociously difficult to identify the fundamental origins of stereo-induction. But I leave the argument in the hands of the reader now. What do you think? This entry was posted on Thursday, July 1st, 2010 at 6:19 pm and is filed under Interesting chemistry. You can follow any responses to this entry through the RSS 2.0 feed. You can leave a response, or trackback from your own site.